To describe why Zero Escape: Virtue's Last Reward was my favorite game of 2012 is to describe why I fell in love with games in the first place. I fell in love with games not when I first played the Nintendo Entertainment System, on which I mastered Super Mario Bros. 3 and Bionic Commando and Faxanadu and a great number of other games, but a few years later, when I was 6 or 7 and picked up Final Fantasy IV, then called Final Fantasy II, for the adorable Super Nintendo. Final Fantasy IV blew my mind. Here was this game, and it wasn't just a game, it was an experience. It was an interactive story with characters and villains and betrayal and a world that felt just as real to me as anything I could touch or taste or smell. It was while playing Final Fantasy IV that something inside of my tiny six-year-old head clicked and I realized, hey, games can actually do what movies and books and TV shows can do. Games can make me feel something. So it is for Virtue's Last Reward, the game that made me feel the most this year. 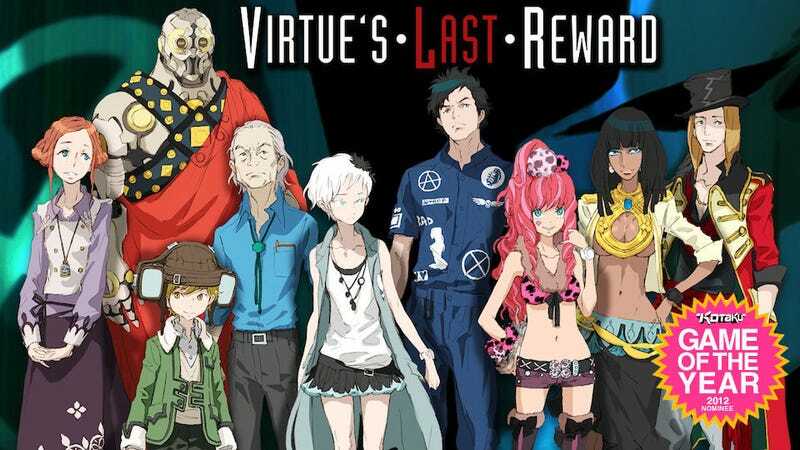 Virtue's Last Reward, an adventure game that most people call a "visual novel" because it's roughly 15% game and 85% book, tells the story of nine people—nine fascinating, flawed people who I call "people" and not "characters" because the writing is that good—who are imprisoned in a strange facility and forced to participate in a sadistic experiment called the Nonary Game. I won't get much more specific than that, but what's important is that as Virtue's Last Reward (available for both 3DS and Vita) unfolds, you're forced to make decisions. Some are mundane—which door will you go into next?—while others are deadly serious—will you betray your partner so you can escape, even knowing that it would kill them? As you make these decisions, you'll inevitably start to wonder what would have happened if you had done something else. This is where Virtue's Last Reward stands out. Imagine if every important decision you made in a video game was laid out on a giant flowchart, and as you progressed, you could visualize every path that you took or could have taken. Now imagine that you could leap around through time and scroll through that flowchart, hopping between branches as if you're reading a choose-your-own-adventure book and keeping fingers on every page. That's Virtue's Last Reward. It's a linear, non-linear story that blurs the lines between what could have happened and what actually happened. To finish the game, you have to go through every branch, unlocking information that you have to remember in order to solve the mystery of where you are and who's forcing you to go through this psychological horror experiment. Eventually, your main character starts getting flashes. He starts to realize that he's been through some of these decisions before, that maybe something bigger is going on here. That maybe the only way to save everybody is to watch them all die. Virtue's Last Reward is my game of 2012 because it tells a story that only a video game could tell. It's chilling, heartbreaking, and emotionally exhausting. There's nothing else like it. The writers of Kotaku are nominating nine games for 2012 Game of the Year. The nominations will be posted throughout the first week of January. The winner of our staff vote being announced on the Monday following and that game will be our 2012 GOTY, shifting 2011 GOTY Portal 2 a little further down our imaginary trophy shelf. Read all of our 2012 nominations, as they're posted.